We’ve stocked a European inspired pantry with the finest imports from France and Italy. Savories like Il Boschetto extra virgin olive oil, Fallot Dijon mustard, pestos, tapenades, and tinned sardines that will make any recipe sing. 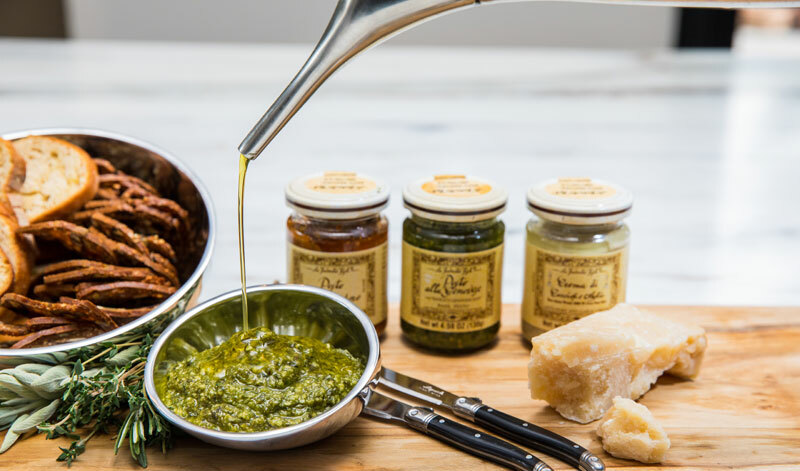 Lest we forget the truffles, sourced from the most highly regarded truffle species in Italy; our infused truffle oils, spreads, and zests (yes, zests!) are delicious on, well, everything. On the sweeter side, farm-based preserves in innovative flavor pairings, sweet floral and bright citrus honeys, crisp butter waffles, and caramel and chocolate spreads that you’ll want to eat straight from the jar (I say this from experience.) For the truly decadent, all natural, handmade, small-batch chocolate from celebrated San Francisco chocolatier, Chuck Siegel. Salty, sweet chocolate cashew bars, melt-away hearts, and chocolate toffee coffee bars – need we say more? Get ready to be addicted. Finally, bar provisions for the cocktail connoisseur. 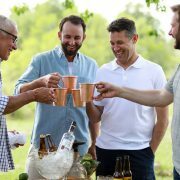 Small-batch cocktail bitters and rim salts that start with the finest ingredients, percolate and macerate with fresh herbs and spices, and result in robust, vibrant cocktail pairings. For a little something on the side, spicy smoked peanuts, dill pickle peanuts, or salty Virginia peanuts. I’m ready for a drink! With all this good stuff, the list goes on and on… but here are a few of our favorite serving suggestions. Presto Pesto: from traditional basil to tomato, eggplant, and artichoke these spreads summon the deep, rich flavors of summer in Italy. Try them on your pasta, pizza, or bruschetta. Mix them with mayo for a wicked sandwich spread. They’ll amp up any antipasti platter, heck, they’re even good folded into an omelet. Truffle Mayo: it’s good on a burger on your favorite sandwich, but try mixing it into mac n cheese or on your roast chicken, mind blown! Truffle Zest: this little jar packs a big punch. We love it on popcorn, roasted potatoes and veggies, or sprinkled on top of avocado toast… the possibilities are endless. Truffle Honey: could there be a sweeter pairing? We love it drizzled over fresh ricotta, on a ripe piece of cheese, or with roasted figs. Preserves for Pairing & Sharing: with flavor combinations like Fig & Walnut Wine, Rhubarb Vanilla, and Raspberry Merlot & Peppercorn, sure they’re great slathered on toast or served alongside freshly baked scones but we think they steal the show on a bountiful cheeseboard or as a glaze for roast meats. Butter Waffles: nothing is better than the original. Light, crisp, and not too sweet, they’re perfect for a dunk in your coffee or tea or with a schmear of caramel, honey, or chocolate sauce. Chocolate Pistachio Spread & Salted Butter Caramel: try them on the aforementioned waffles (heaven! ), with an ice cream sundae, or atop a cheesecake… or just with a spoon is 100% acceptable. If you’re looking for a thoughtful hostess gift, a treat for a foodie friend, or some effortless dinner party inspiration you’ve come to the right place. In addition to artisanal gourmet goods, we’ve stocked the larder with beautiful kitchenware and serving pieces to pair with your epicurean delights. Just in from France, a collection of iconic and oh so irresistible enameled cast iron cookware from Staub. From colorful prep bowls to miniature Dutch ovens, sauté pans, and cocotte sets, these gems are perfect for prep, serving individual portions, or condiments and sauces. Hot off the kiln, we have a bountiful new collection of earthy, organic pottery to bring a little texture to your table. Plus decorative appetizer plates and bowls to add some flair to your existing serveware, rustic charcuterie boards, cheese knives and spreaders, and more! Let Homefest help you make each meal, each gift, and each party memorable. Stop in or shop online for our latest gourmet finds. *select items available in-store only.